Festive Christmas Gingerbread Cookies, decorated with simple white icing, silver balls and with red and green ribbons. They can look so cute hanging on your Christmas Tree! They would also make lovely home made presents! I have revised last year’s recipe into a healthier version of Gingerbread cookie dough, made with almond flour and coconut flour. Everyone will love this, even non Celiacs! This version includes also chocolate. 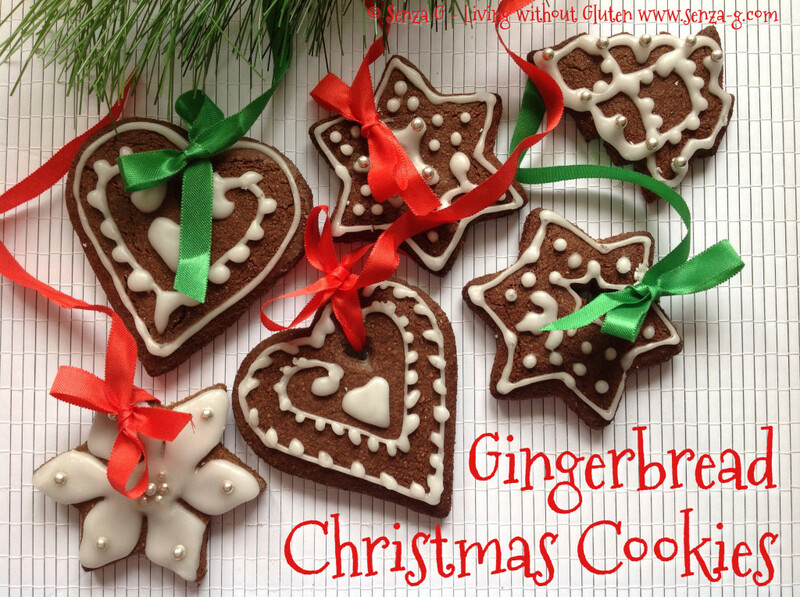 You can use this recipe to make the Gingerbread House, the Melting Snowman Cookies, Gingerbread Men and Christmas Cookies. In a medium bowl whisk the flours with the cocoa, ginger, cinnamon, cloves, baking soda, baking powder and salt. In a large bowl using a hand held mixer, beat the softened butter with the brown sugar until fluffy. Beat in the egg, then molasses or syrup, then the melted chocolate. Add the flour mixture in three batches, incorporating well between additions. The dough will look more like thick mud, so do not panic. Cut off half of the dough to work with, but leave the rest in the fridge, as it rolls better when chilled. Roll out the dough on a lightly floured surface to about ¼” thick. You can roll the dough between two pieces of parchment paper. Cut out into different shapes, stars, trees, hearts etc. Using a skewer make a hole, moving it around to make the hole wider. Or you can use mini cutters, like stars or hearts instead. When the cookies cool, decorate with white icing. When the icing dries completely pass the red and green ribbons through the holes.